Anglers fish from the shore of the Toilet Bowl below Ruedi dam last summer. Despite confusion created by signs, fishing from the shore is still allowed. 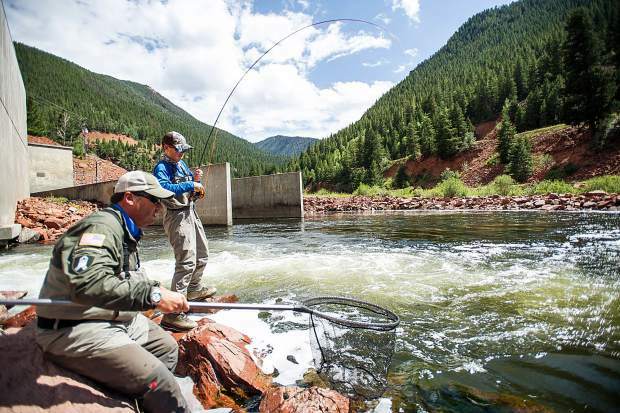 Contrary to some perceptions, anglers haven’t been flushed from the shores of the Toilet Bowl below Ruedi Dam, Colorado Parks and Wildlife announced Friday. People will still be allowed to fish from the shore, but no one can enter the turbulent waters of the Toilet Bowl for any reason, the agency said. The prohibition extends to paddle boarding, free diving, swimming and wading. “There was one infamous case where a person was scuba diving in the area,” said Mike Porras, public information officer for the Northwest Region of Colorado Parks and Wildlife. 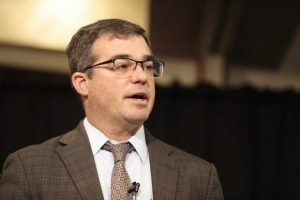 The diver posted video on social media at the end of November and it came to the attention of concerned agencies, according to Peter Soeth, spokesman for the U.S. Bureau of Reclamation. The video also showed a paddle boarder in the Toilet Bowl, he said. The Eagle County Sheriff’s Office was able to contact the man and he agreed to remove the post because it could encourage other people to try it, said Amber Mulson-Barrett, spokeswoman for the sheriff’s office. The man wasn’t cited. She clarified that the person was skin diving rather than scuba diving. “He didn’t have any apparatus,” she said. The incident triggered concerns for the safety of people entering the water. Signs were installed that created confusion about whether fishing from the shore was allowed, Porras said. Mulson-Barrett said the signs that were posted could be interpreted to mean fishing was banned, as well. Porras said there were “social media rumors claiming that the Toilet Bowl would no longer be accessible to anglers.” There were also rumors that some anglers were told by authorities they must fish elsewhere, he said. That caused consternation because the bowl is popular with anglers because of the large trout that thrive in the pool. The signs will be replaced soon, multiple officials said. 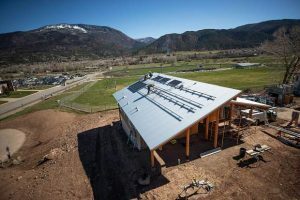 Confusion was exacerbated because officials recently repaired a fence protecting a hydroelectric plant by the bowl that’s operated by the city of Aspen. A vehicle ran into the fence. The fence was repaired and a gate is being installed this spring to help keep vehicles away. The replacement fence was interpreted by some observers as a barrier to anglers. 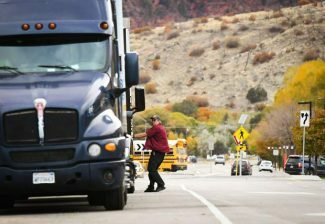 “The fence and the gate only restrict vehicle access, not foot traffic,”District Wildlife Manager Matt Yamashita of Basalt said in a statement. Officials from the sheriff’s office, reclamation bureau, the wildlife agency, U.S. Forest Service and city of Aspen met last week to “get on the same page,” Mulson-Barrett said. Soeth said the Toilet Bowl is about 30 feet deep. The water is turbulent because of releases from the dam, and the flows and depth can change without notice. There are a lot of moving parts to the hydroelectric facility, including intake pipes, Soeth said. “People could get sucked up against the pipe and not be able to get up,” he said.